Obituary – Knox, Ethel « Perry High School Alumni Association, Inc.
Ethel Knox, 91, former Perry teacher, died at 4:34 p.m. Sunday, August 25, 1991 at Perry Memorial hospital. Graveside rites have been set for 10 a.m. Wednesday at Grace Hill cemetery under direction of Brown Funeral home. Rev. Bill Stacy, pastor of the First United Methodist church, will officiate. Miss Knox was born Jan. 13, 1900, at Abilene, Kan., the daughter of Alan and Katherine Knox. She moved to the Perry area with her family when she was one month old. She was a graduate of Perry high school and Oklahoma A&M. 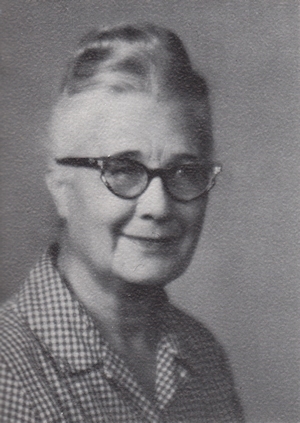 She began teaching in Perry in the early 1930s and also had been a pianist and organist. 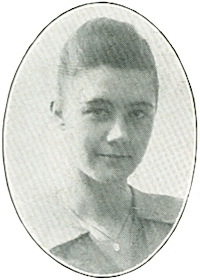 Miss Knox was a member of the First United Methodist church and Delta Kappa Gamma honor society. She taught Sunday school for 50 years and was a member of the board of directors of Perry Carnegie library for 25 years. Among survivors are cousins, Herman Eisenhauer, Omaha, Neb. ; Joe Knox and John Knox, Santa Anna, Calif.; and Helen Kingsbury, Garden Grove, Calif.
Memorials may be made to the Methodist church or the Methodist Boys Ranch. With sincere respect and admiration, we proudly dedicate this 1964 edition of the Maroon Spotlight to Miss Ethel Knox. By giving of her time and service for the benefit of our school, in aiding students in the quest for learning and good citizenship and by molding lives in the true tradition of Perry High School, we are proud to present Miss Knox as a concrete example of the effort our school is making to produce fine, useful citizens of tomorrow.